How Do Testicles Know When To Stop Making More Sperm? Every time someone ejaculates, it produces millions of sperm. But the average pair of testicles produces billions of sperm cells over an entire lifetime. Why don’t they create all of their sperm in one go? Answer: Because testicles have a complicated process to avoid running out of sperm and endangering future fertility. 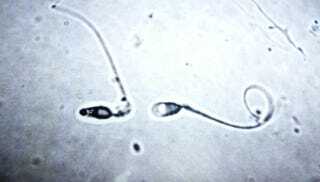 Sperm cells are derived from stem cells, that are tucked deep inside the testes. When these stem cells divide, they have a choice: They can become another pair of stem cells that will remain inside the testes. Or they can become a pair of more specialized cells, that start down the road to becoming sperm. Testes need to keep these choices carefully balanced if their owners are to remain fertile: if too many cells change, the organs’ reserves of stem cells could vanish, leaving them unable to make new sperm. But if too few change, sperm counts would fall, as the testes filled with stem cells. When it’s time to make new sperm, the body releases a pulse of retinoic acid, a chemical derived from Vitamin A, into the testes. All of the stem cells get the signal at the same time. But only some of them make the shift to becoming sperm. According to new work on mice by Kanako Ikami and her colleagues at the National Institute for Basic Biology in Japan, this distinction is the result of a single difference inside the cells. When Ikami looked closely at the genes these cells were using, she found they fell into two distinct groups: One group made a protein with a shape that retinoic acid could dock with, the other did not. The cells that could bind retinoic acid went on to become sperm, the cells that remained deliberately blind to the signal kept producing more stem cells. When she forced the “blind” cells to make the docking protein and exposed them to retinoic acid, those cells shifted onto the sperm-making path. All of the stem cells within the testes are perfectly capable of making sperm — but one little switch keeps them from doing it all at once.